Politicians and lobbying groups still regularly dismiss the science of climate change and efforts to increase the use of cleaner forms of energy like wind and solar. However, any opposition to the spirit of renewable energy could be a moot point soon as the cost of energy acquired by modern photovoltaic continues to drop. The International Energy Agency reports that nations from all regions have seen the market for solar power growing this year. In fact, solar power is growing by as much as 25% in some countries as the price continues to drop. There’s a lot of gloom and doom about the state of our energy infrastructure, but there is some hope we could be entering a renaissance for solar power. Much of the reporting we do on solar energy focuses on the cutting-edge research that shows big gains in the efficiency of solar cells. Some multi-junction concentrator designs for solar cells have shown as much as 43% efficiency (theoretical efficiency of over 80%), but these are very expensive systems that don’t work as well in real life conditions over time. 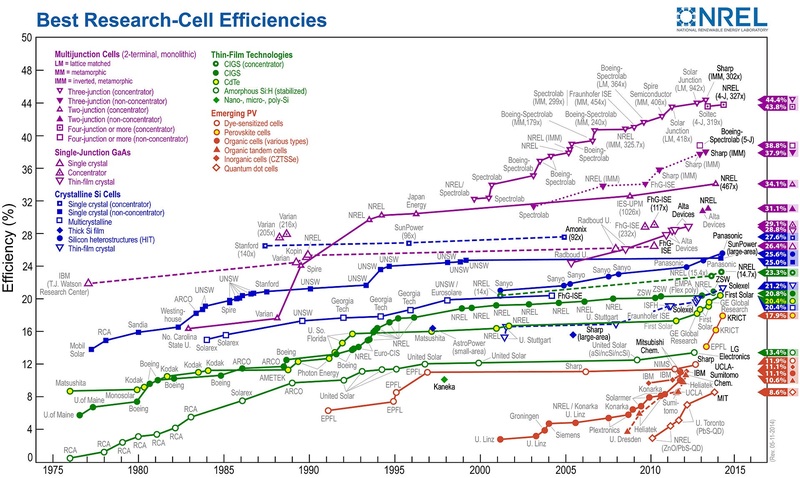 The mainstream solar cell technologies are still based on inexpensive silicon designs and have a maximum theoretical efficiency of 34%, but the real life performance is around 22%. It turns out, that might be good enough to make solar power viable. Solar power is expanding thanks to an ongoing drop in the price of regular solar cell technology. Since 2008, the cost of solar panels has dropped by almost 80%. At that point, it doesn’t really matter if we can hit the 50% efficiency in real life usage — it’s already cheap enough to begin displacing traditional forms of energy. The price reduction is due to a near-constant increase in production from China, which now cranks out more solar panels than any other nation. China also became the world’s largest generator of solar power in 2015, surpassing Germany. So, how far can this go? The indisputable truth is that solar energy is the most abundant source of power we have on Earth. The sun is a giant nuclear fusion reactor, beaming more energy at Earth every day than we could possibly use. We just need to capture a small slice of it. This year, Harvard physicist David Keith admitted he was incorrect about the limits of photovoltaic technology. Solar power, he speculates, could reach the unheard of cost of just $20 per megawatt-hour by 2020. That would make it the cheapest electricity on the planet. Utilities that were once only grudgingly investing in solar as part of government programs are now embracing the technology with an eye toward the future as the costs continue to come down. Imagine what might happen if one of these far-out solar panel technologies like multi-junction cells or perovskite thin films are developed into a viable real-world product? It could result in a fundamental shift. That still leaves us with the problem of storing all that power. The sun doesn’t shine all the time, so we need batteries to store daytime power for night. Battery technology is still lagging, so for the time being traditional forms of energy like natural gas will still be necessary to fill in the gaps.